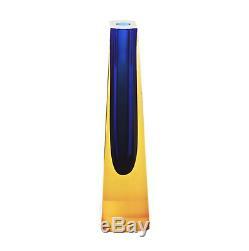 Czech Art Glass Submerged Vase Pavel Exbor Eye Catching Royal Blue / Amber. 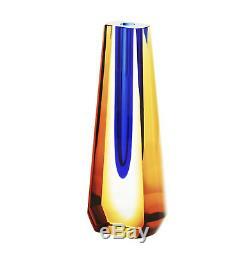 Very eye catching facet cut and polished glass vase. Clear glass submerged with a scoop of dark blue over dark amber reflecting with the light. 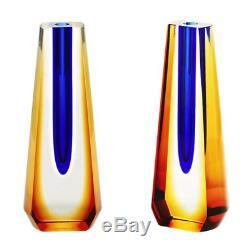 The first picture shows the same vase at 2 different angles not 2 vases. The sale excludes any other items shown in the pictures. A top quality glass example. The colour can appear to be more intense in different light conditions and angles. Measures 13.4cm tall and width at widest point is approx 4.5cm. We do not deliver to PO BOX addresses due to changes of couriers terms and conditions. Please be aware that many of the pictures we use in most of our listings, are not of the actual item you will receive and are generic to the item/s. The reason for this is when we have multiples of the same item. This information is given to all buyers in advance. It is very important to always be aware that when. You are purchasing vintage or modern day glassware, the following important information applies. We work very hard to always inspect all our items in careful detail to note any major faults such glass disturbance / cracks / chips within the description of each listing. Please note that you should always expect to see some age-related marks or signs of wear such as very surface scratches/marks on the outer surface with movement. Due to many glass items been handmade, you may see small imperfections such as bubbles, inclusions & lumps/speckles within the glass mass and often tool marks which can be seen from where they have been shaped and worked during the manufacturing/making/blowing process. 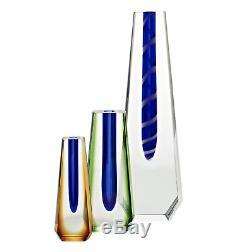 We mention this because most people such as collectors of glass and dealers including new buyers of glass do not look as faults or damage, but as part of the character and due to the age/type of handmade/blown manufactured glass and are not usually mentioned in the main description of the listings. 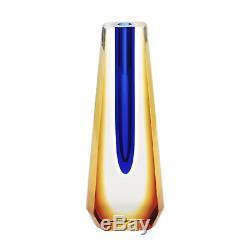 The item "Czech Art Glass Submerged Vase Pavel Exbor Eye Catching Royal Blue / Amber" is in sale since Saturday, March 16, 2019. This item is in the category "Pottery, Porcelain & Glass\Glass\Art Glass\Bohemian/Czech". The seller is "emporium-decors" and is located in Bradford. This item can be shipped worldwide.